Turning the Phage on Produce Pathogens Even bacteria have their nemesis. Tiny viruses, called phages, infect and kill bacteria naturally, including the foodborne pathogens that sometimes make humans so sick, they wish they were dead. So why not put these phages to work on fresh-cut fruit, thought ARS plant pathologists Britta Leverentz and William S. Conway at the Produce Quality and Safety Laboratory in Beltsville, Maryland. Since phages home in on a bacterium's surface proteins, they are very selective about their hosts. Phages specific for Salmonella, for instance, would leave beneficial bacteria free to multiply on fresh-cut produce and crowd out potential pathogens, Leverentz explains. What's more, these tiny viruses are natural, safe, and ubiquitous. A small dropperful of fresh water from a stream or lake, for example, contains an average 250 million phages. Before antibiotics, phages were used to treat human infections in the United States and are still used therapeutically in other parts of the world. Phages are already under study to control pathogens in poultry, meat, and eggs. Leverentz and Conway are the first to investigate their potential to reduce pathogens on fruits and vegetables both whole and fresh-cut. They are working under a cooperative research and development agreement with Intralytix in Baltimore, Maryland, which is providing known phages for Salmonella Enteritidis. A patent application has been filed on the use of phages with produce. Human infections with S. Enteritidis usually come from products containing eggs. But during the last 10 years, various Salmonella strains, including S. Enteritidis serotypes, have been associated with contaminated produce. The peel or rind of intact fruits provides a physical and chemical barrier to microbes, says Leverentz. However, the growing market for fresh-cut produce could become another channel for pathogens to reach humans. Bacteria multiply rapidly on cut surfaces especially if those surfaces are not too acidic and have warmed up to room temperature. Leverentz chose fresh-cut melons, with low acidity, and apples, with higher acidity, to test a cocktail of four anti-Salmonella phages under conditions likely to occur during normal food processing and storage. She inoculated each slice with 1 million bacteria and 100 million phages. The results on the melons were very encouraging, she says. 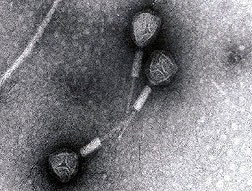 The phage cocktail consistently reduced Salmonella more than a thousand fold on melon chunks stored at 40°F and 50°F and more than a hundredfold on fruit stored at 68°F, or room temperature. But on apples, the phages made no detectable dent in pathogen numbers. Apparently the fruit's higher acidity reduced phage survival, says Leverentz. But she and colleagues are already looking for acid-tolerant phages or a way to buffer the viruses against acid. Conway says the industry is seeking alternatives to chlorine and other sanitizers now in use. Bacteria are developing resistance to chlorine, which can also be irritating to humans. Solutions are often too dilute or too overused to reduce bacteria more than 10- to 100-fold, he says. That's a far cry from the industry's goal of 100,000-fold reductions. Conway suspects the phages may have to be combined with other treatments, such as natural bacteria-killing compounds, to reach that goal for commercial use. By Judy McBride, Agricultural Research Service Information Staff. This research is part of Food Safety, an ARS National Program (#108) described on the World Wide Web at http://www.nps.ars.usda.gov. Britta Leverentz and William S. Conway are with the USDA-ARS Produce Quality and Safety Laboratory, 10300 Baltimore Blvd., Bldg. 002, Beltsville, MD 20705-2350; phone (301) 504-6128, fax (301) 504-5107. 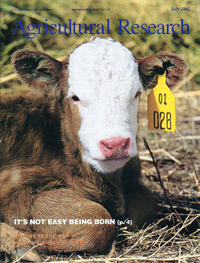 "Turning the Phage on Produce Pathogens" was published in the July 2001 issue of Agricultural Research magazine.